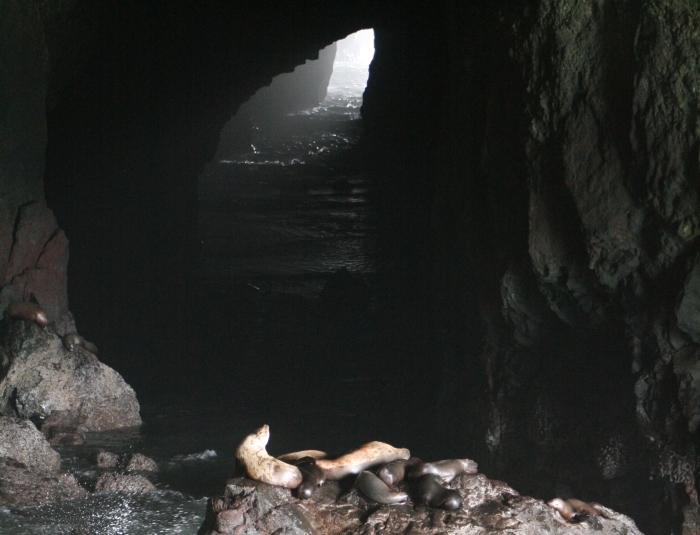 To be honest, we weren't expecting too much when we visited the Florence Sea Lion Caves along the Oregon Coastal Highway, on our way from Florence to Yachats. Why pay to see sea lions, when you can see them for free all along the Pacific Coast, even if they are in the world's largest sea cave? 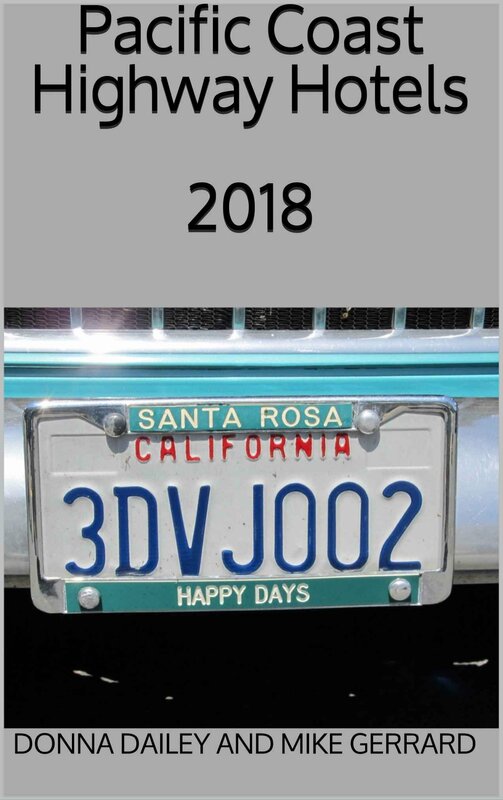 How wrong we were. 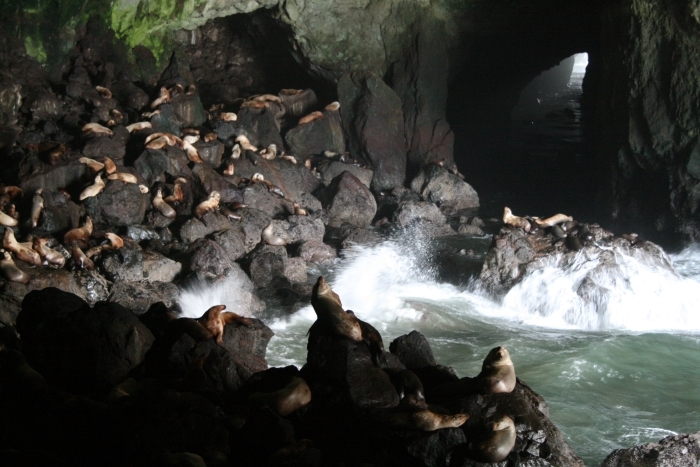 The Florence Sea Lion Caves turned out to be one of the best wildlife attractions on the whole Pacific Coast Highway. It was late in the day on a cold and grey March afternoon when we visited. There's a big free car park, and lots of visitors despite the dull weather. 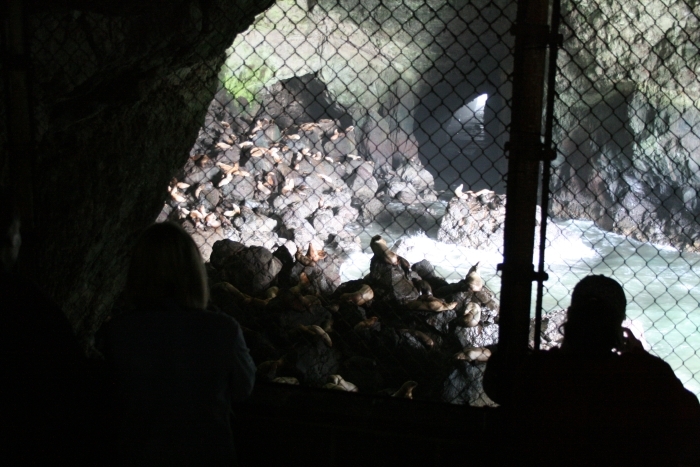 Lots of sea lions too – about 200 in the caves right now, we were told at the ticket desk. It's hard to picture that number till you see them, but first we walked around outside. To the south there's a viewing platform, and we got great views of sea lions lazing on the rocks, and pups playing with each other. 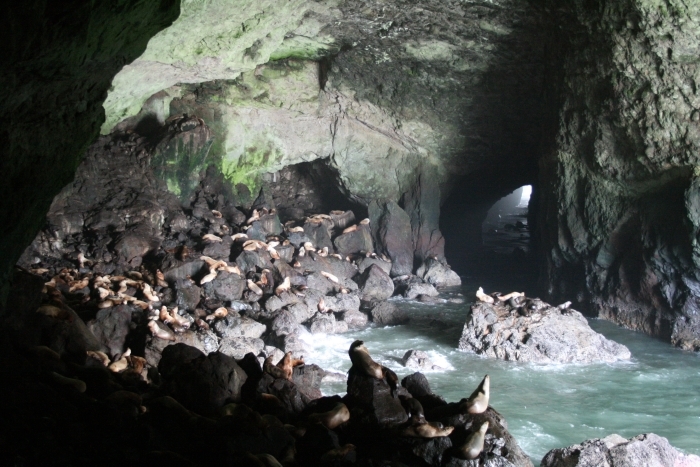 The Florence Sea Lion Caves were first opened to the public in 1932, and an elevator was added in 1961 to take visitors down 208 feet to the viewing area. It's an odd feeling, taking an elevator deep underground, but that's nothing to the amazing sight that greets you when you get down there. From the elevator you walk along a passage, where there are displays about the sea lions. This takes you to a dark area, where there are holes in the rock looking right inside the world's largest sea cave. And the cave is just filled with sea lions. Some of them are only a few feet away, seemingly unaware of the visitors there in the semi-darkness. You're asked not to use flash photography, so as not to disturb the animals. The cave was formed about 25 million years ago, but was only discovered in 1880. Made of basalt rock, it is as high as a 12-story building and covers an area the size of a football field. 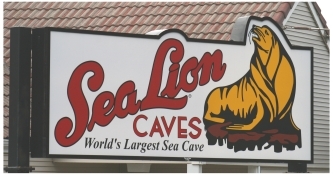 Though the weather may not be as good, the best time to visit the Sea Lion Caves is during the fall and winter. 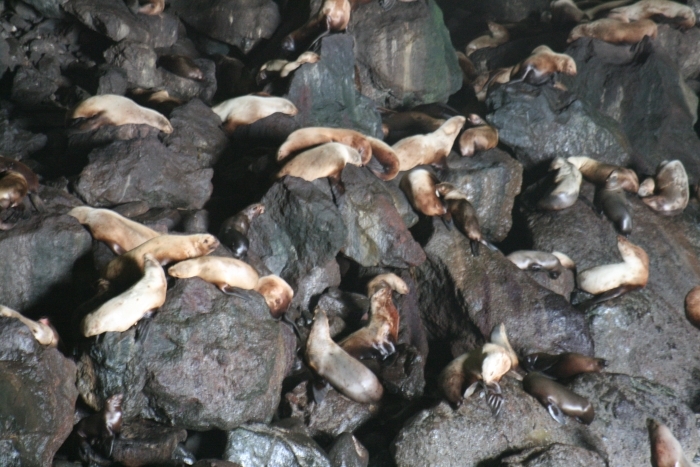 That's when most sea lions congregate together inside the caves. In the winter of 2009-10, when the sea lions inexplicably disappeared from around San Francisco's Fisherman's Wharf, many turned up later in the Florence Sea Lions Caves! Scientists said that the animals do normally migrate north in winter in search of food, but that winter they went to the Oregon coast in unusually large numbers. It's like suddenly walking into a wildlife film on TV, but with one extra dimension – the smell! It's not too unpleasant, but it's certainly a strong and fishy whiff. It's only matched by the noise, the honking of the sea lions echoing round the cave. 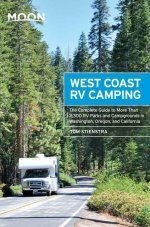 Add the smell and the sound to the stunning sight of all these animals inside this vast cavern, with the waves crashing in from the sea, and it all adds up to the one of the best wildlife experiences we had on our Pacific Coast Highway trip. 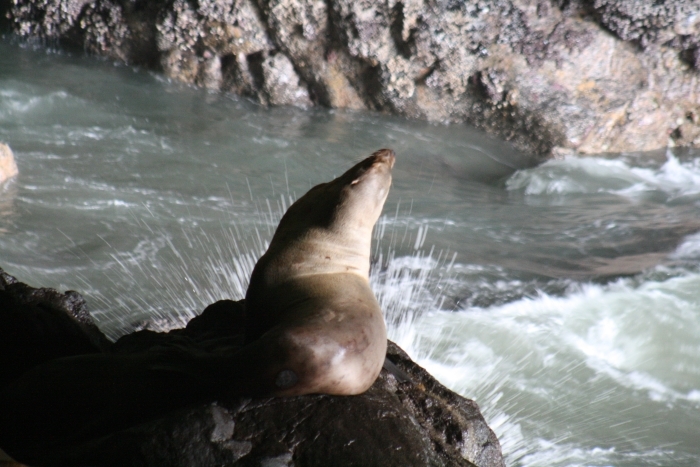 What Else at the Florence Sea Lion Caves? As well as the caves themselves, and the displays, there are also good views and photo opportunities looking along the coast to the north. Terrific views of the Heceta Head Lighthouse, past cliffs that are filled with seabirds, water dripping down them, a waterfall tumbling into spray down the mossy cliffs. There are guillemots and gulls, and crashing white waves on the rocks.